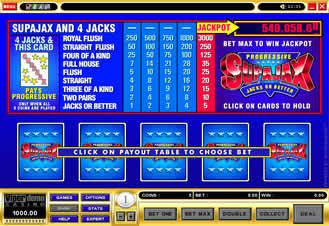 Supajax is a Video Poker game featuring Jacks Or Better, and is connected to over 90 casinos powered by Microgaming's advanced casino systems. New casinos are joining this system and continuously adding to the overall jackpot being offered to Supajax players. Supajax Progressive Video Poker accumulates deposits from its players at all participating casinos and creates large jackpots starting at $5,000. You must bet the max $5 to have a chance of winning progressive jackpot (hit Supajax & 4 Jacks to win, Royal Flash pays 1:250). The complete payoff table can be found on the image below. The game is based on Jacks Or Better that has one of the lowest house edge among the Video Poker games of just 0.46%, e.g. the highest odds for players. Congratulations to Supajax's winner Martha H who won $21,627.26 at The Gaming Club on October 22, 2004 and Denise K who won $23,096.20 at Captain Cook's Casino on Monday, September 26, 2005. SupaJax online progressive slot has paid out $32,991.37 to a total of 3 jackpot winners in September 2005 alone. See all Supajax jackpot winners here.